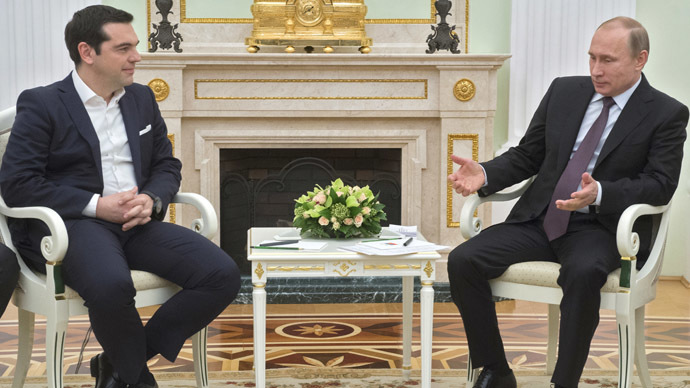 Athens has not formally asked Moscow for financial help to pay off its debt, Russian President Putin said after he met with Prime Minister Alexis Tsipras in Moscow on Wednesday. “The Greek side did not contact us with any requests for help,” the Russian president said, when asked by a journalist whether Russia could help Greece with its debt burden. Russia will not directly aid Athens to pay off its €316 billion debt, but Moscow could help out by buying Greek state assets in privatization sales, or in other investment projects, such as Turkish Stream, Putin said.In 2015 the Greek government plans to privatize €1.5 billion worth of assets. "If we are going to implement some major projects this will generate income in Greece, and revenues can be used to repay these loans,” the President said. Gazprom unsuccessfully tried to buy a controlling stake in Greece’s Public Gas Corporation [DEPA] for €900 million in 2013, when Antonis Samaras was prime minister. Fielding questions from journalists, Putin said a solution to Greece’s debt will be a win for all parties involved, from the EU to Russia. “If the Greek economy grows thanks to Russia, and can pay off its loans to the EU and creditors, it will help everyone,”he said, adding that politics shouldn’t get in the way of economic recovery for Greece. There was speculation that Tsipras, who traveled to Moscow just days before $500 million was due to the IMF, would ask Russia for financial help. In early February Russian Finance Minister Anton Siluanov was the first Russian official to say Moscow was ready to provide financial help to Greece if asked. He made the comment just after the new Syriza government won the election on the promise of ending austerity and getting better conditions on its EU debt.